I’ve been making my Rocky Road a little differently lately. I used to either just pour chocolate on everything, or make a golden syrup/butter chocolate mix and cover the biscuity bits in this, and then top it with melted chocolate. But, lately, I’ve started making a buttery chocolate mix and using this for both parts. It’s just easier, and I like the texture better. Out of the fridge, it goes a little soft, but kept in the fridge it’s nice and firm. 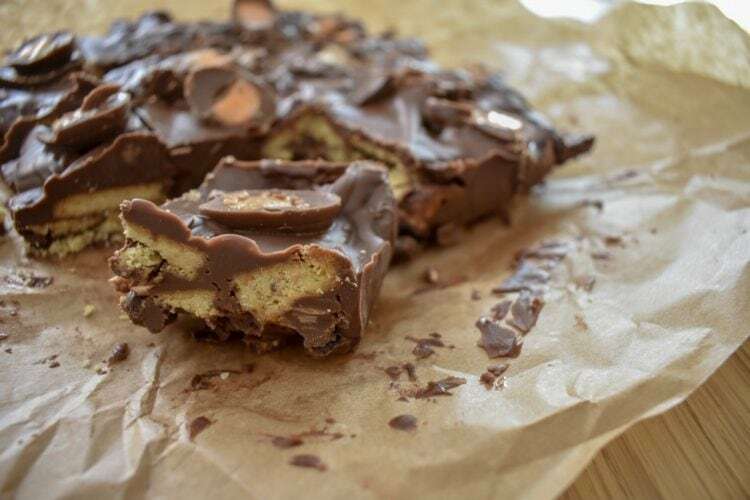 This means that this is actually the second Easter Creme Egg Rocky Road on my blog. Have a go at both and see which works better for you. 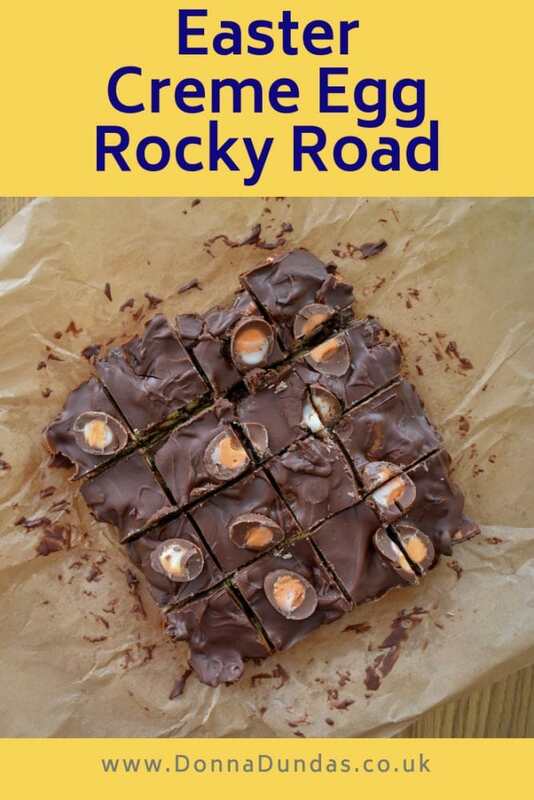 Rocky Road is one the best ways to do something a little more interesting with all of your Easter Treats. It’s easy, cheap, there’s no-bake required and it’s absolutely perfect for making with kids. 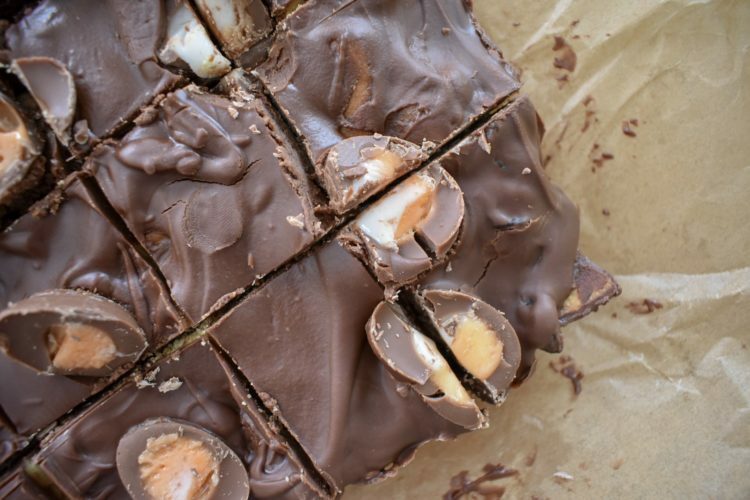 Mine love this Easter Creme Egg Rocky Road and are only happy to help. You can, of course, use other chocolates if you prefer. 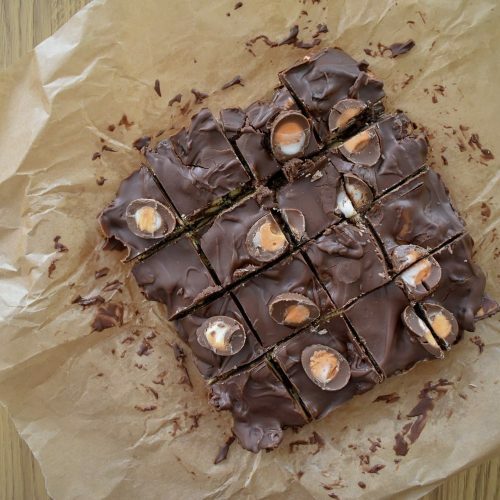 Mini Egg Rocky Road is another favourite of ours. I tend to stick to raisins, marshmallows and digestives, but I know a lot of people prefer the crunch of a rich tea. You can add glacé cherries, nuts and pretty much anything else too. Such is the beauty of Rocky Road. For my Easter Creme Egg Rocky Road I mix 100g of Dark Chocolate and 200g of Milk. It takes quite a lot of chocolate to cover all the biscuits well and have enough left for a thicker layer on the top. So 300g is about right. All dark chocolate is a little too bitter for me, but all milk with butter is very very sweet. I like the 1/2 ratio, I think the flavour is just right, especially with the milk chocolate Creme Eggs.